Situated in an ideal Midtown Manhattan locale near Rockefeller Center - MoMA and Fifth Avenue - The Benjamin is one of the most luxurious boutique-style hotels designed by famed architect Emery Roth. The beaux-arts gem offers 209 newly redesigned accommodations by Lauren Rottet. Room types range from guestrooms with kitchenettes to one-bedroom terrace suites. The hotel promises to help guests be at their best with thoughtful services and amenities including Federico Hair and Spa - a Technogym-equipped fitness center - a private business networking lounge - artwork by artist/photographer Arthur Keller - a fitness concierge - and sleep solutions by Sleep for Success co-author Rebecca Robbins. Iron Chef Geoffrey Zakarian offers The National Bar and Dining Rooms on the first floor of The Benjamin; it is noted as one of the 50 favorite New York restaurants by The New York Times. 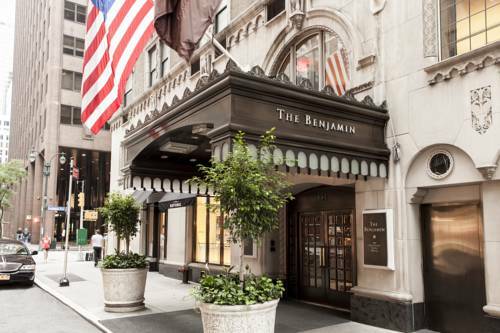 The Benjamin enjoys an ideal midtown Manhattan locale near Rockefeller Center - MoMA - Fifth Avenue - numerous corporate offices and popular attractions. The Citys Midtown East area is home to some of the worlds most well-known department stores - including Lord and Taylor - Bergdorf Goodman and the original Saks Fifth Avenue. Several other iconic New York landmarks are just steps away - including the Chrysler Building - the United Nations - St. Patricks Cathedral and Grand Central Station. The menu at The National offers classic bistro dishes with Zakarians signature Modern American touch. Cuisine is fresh and accessible concentrating on American ingredients prepared with French technique. The bar at the National offers a top rate selection of wines as well as an eclectic selection of cocktails and assorted other beverages. The Braxton Room offers space for meetings up to 10 people - natural daylight and access to pre-function space. The Corner Room is great for meetings of up to 50 persons offering natural daylight and access to pre-function space. The Avery Room offers space for meetings up to 10 people - natural daylight and access to pre-function space. The Dunhill Room offers meeting space for up to 22 people - natural daylight - video conferencing and access to pre-function space. The Lexington Room offers conference facilities up to 150 people with natural daylight - video conferencing and access to pre-function space. The Century Room offers space for meetings up to 10 people - natural daylight and access to pre-function space.